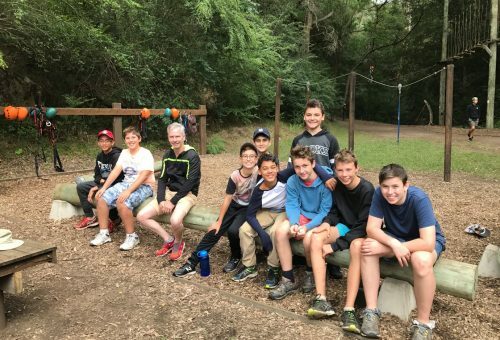 On Monday 6 March, the entire Year 8 cohort embarked on a four day camp at the Somerset Outdoor Learning Centre in Colo. Camp Somerset offers a wide range of action-packed activities like Bush Walking, Rock Climbing and Canoeing. Many of the activities are designed to test the patience and comradery of the boys with activities like raft-building requiring good team working skills. In addition to the physical activities, boys were also given the responsibility of cooking their own lunch and dinner, and cleaning up afterwards. Some evenings, dinner took the form of the “My Campsite Rules” cooking challenge, with the boys versing their peers in cooking up a storm using the provided ingredients for their teacher and camp leader to judge – definitely a highlight for all present. Year 8 students are to be congratulated on the way they conducted themselves, accepting the daily challenges and participating in activities which tested their individual comfort levels whilst allowing them to grow and mature as young men.